These are days of Qadian Jalsa Salana. This year the Jalsa will commence tomorrow. Meanwhile Jalsa Salana has begun today in Australia and West Coast of USA. Jalsa Salana Qadian has special significance as it is the hometown of the Promised Messiah (on whom be peace) and this is where Jalsa Salana was first initiated. Hazrat Musleh Maud (may Allah be pleased with him) has spoken about Jalsa Salana held during the lifetime of the Promised Messiah (on whom be peace) in his various addresses and has also spoken of some of the revelations of the Promised Messiah (on whom be peace). Hazrat Musleh Maud (may Allah be pleased with him) recalled from his childhood days about 200 to 250 people sitting on a rug on part of a rampart/bulwark around Qadian. The Promised Messiah (on whom be peace) was also seated on the rug, it was the month of December and everyone had gathered for Jalsa Salana. Hazrat Musleh Maud recalled the rug was moved three times and as a young child he was not sure of the reason of it being moved around three times. Whether those people were restricted from placing the rug in some areas or whether there was another reason for moving it. 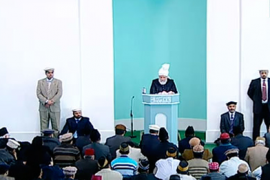 He said that people could not appreciate the situation of those past days because at the time Hazrat Musleh Maud spoke proper arrangements for Jalsa were in place. Hazrat Musleh Maud said that those 200-odd people sitting on a rug, who were asked to move from one spot to another, had gathered there because Islam was in a very frail state at the time and people of darkness were doing their utmost to extinguish its light. These people comprised just a fraction of world population, most of whom were not well-off. Even by the standards of India very few among them belonged to the middle class. They had gathered to uphold the banner of the Holy Prophet (peace and blessings of Allah be on him) they were prepared to perish but were not going to let his banner wane. These 200-odd people had come to make sacrifices in the face of huge humanity just as in the Battle of Badr Companions had vowed to the Holy Prophet (peace and blessings of Allah be on him) that although they were very few against a huge and strong enemy they would make sure the enemy would have to trample their dead bodies in order to get to the Prophet. It is said that when Hazrat Yusuf (on whom be peace) was brought in the marketplace in Egypt to be sold, an old woman brought along two cotton wool balls thinking she could purchase him with the cotton balls. His brothers had sold him off for a paltry price. If the old woman had assumed to buy him off with cotton wool balls that was possibly because cotton was a rare commodity in those days, only available in Egypt and was not available from where the caravan had come. Likewise, the people around the Promised Messiah on a bulwark had also gathered based a paltry price. Yet their narrative is most distinctive than that of Hazrat Yusuf being sold in the marketplace and is a more distinct example of the ardent love by virtue of which one loses one’s senses and a love which leads one to make sacrifices which are beyond imagination. The hearts of the 200-odd people had pleaded to the Lord of the heavens. Indeed, many of them would have had their parents living at the time, many of them would themselves be fathers but when the world derided them and abandoned them as crazed people, for all intents and purposes they became like orphans and the dispossessed. Addressing Ahmadis of his time, Hazrat Musleh Maud said, then, in accordance with Divine promise that the cry of orphans moves the heavens, the situation was created which was before them. Indeed, today the progress and advancement is that much greater, the Jalsa venue in Qadian is huge by comparison and Jalsa proceedings are translated in seven to eight languages simultaneously, people of various nations have gathered there, including those from Pakistan who are deprived in their own country to openly practice their faith. People gathered in Qadian today should instil the same sincerity and belief that the 200-odd attendees of earlier Jalsa had. Likewise, Jalsa is taking place in Australia and West Coast of USA. The Jama’at has grown in these countries but if they wish to enhance themselves, they need to develop in spirituality. The seedling of the 200-odd Jalsa attendees of yore has today resulted in what the Jama’at has become. It is thus our responsibility to develop in faith and be recipients of the Divine promise of triumph. Our numbers as well as our means are still small compared to world population but we have to do the same tasks that our forefathers did. Our objective is huge. Those gathered in Qadian should pray a lot for the same. A revelation of the Promised Messiah (on whom be peace) was: People will come to you from every distant track. Presents will come to you by every distant track. Great arrangements will be made for hospitality. So many people will come to you that the track by which they will come will deepen with excessive travel. Hazrat Musleh Maud (may Allah be pleased with him) goes on to say that he was a child when this revelation was first received but he remembered the modest and unassuming place Qadian was at the time. How it had places where rubbish was heaped and how even a small quantity of flour was not available in Qadian. People would grind wheat for their own use. If he needed something the Promised Messiah (on whom be peace) had to send someone to Lahore or Amritsar to fetch it. No one visited Qadian and Promised Messiah was not known to people of his own neighbourhood let alone people from outside town. In fact people only knew his eldest brother and assumed his father had only one son. It was at such a time that God revealed to the Promised Messiah (on whom be peace) that He would honour him, in fact honour would come to him. At the last Jalsa Salana of the Promised Messiah’s (on whom be peace) life seven hundred people turned up and there was so much mismanagement that they were not fed till 3 am. This is when the Promised Messiah (on whom be peace) received the following revelation: ‘O Prophet, feed the hungry and the distressed.’ (Tadhkirah, p. 988) It was found out in the morning that people had stood by the Langar Khana till 3 am and were not fed. The Promised Messiah instructed to put pots on and feed the people. When the Promised Messiah (on whom be peace) went for a walk the seven hundred strong crowd went with him. They may have seen such a spectacle in funfairs but never on a spiritual level. There was a lot of pushing and jostling. The Promised Messiah was himself jostled about, so much so that his shoe would come off after walking a few feet and someone would assist him in putting it back on. Among these 700 people were two Ahmadi farmers. One asked the other if he had shook hands with the Promised Messiah. He replied that was not the time for a handshake because he could not possibly get near the Promised Messiah. The first one remarked when else would he get a chance to have a handshake with the Promised Messiah? He told his friend to go ahead even if it meant his body was lynched in the process. Indeed that was a time when problems arose catering for 700 people and it was considered difficult to have a handshake. Today, God’s succour is with the community and thousands from various countries have gathered in Qadian for Jalsa. Dietary requirements of people from different parts of the world are catered for and great hospitality is taking place. This is replicated in other countries as well. The Promised Messiah (on whom be peace) used to say that the Jama’at had grown considerably and it appeared that his task was done. He would often repeat that the task for which God had sent him was done. So many people had accepted him that his job was done. Things have of course moved on a massive scale and now thousands gather all over the world for Jama’at events. These are amazing signs indicative of Divine succour. Enmity also increases with such progress but whatever is in God’s decree comes to pass. Doubtlessly such progress is delightful, however, it also draws our attention to the responsibilities we have. The Jama’at is established in more than 200 countries and progressing. Enmity towards us was initially confined to the subcontinent but now it is spreading to other countries. Two days ago a local Ahmadi was martyred in Kyrgyzstan. Earlier today at the time of Friday Prayers an explosion took place in one of our mosques in Bangladesh in which some Ahmadis were injured. May their injuries not be life-threatening and they have speedy recovery. Our opposition borne of envy is on the increase and it will continue to increase just as our progress will also increase. Another revelation of the Promised Messiah (on whom be peace) has double meanings. Hazrat Musleh Maud said we cannot interpret it in a specific way nor do we know when and how it will be fulfilled. The revelation is in Urdu لنگر اُٹھا دو [Langar in Urdu means public kitchen as well as anchor]. If langar here is understood to be ‘anchor’ the revelation would signify step out and spread God’s message everywhere. However, if it is understood to be Langar Khana, it would signify number of guests has exceeded so much that it is not possible to organise Langar Khana and people would have to be told to organise their own meals and accommodation. We cannot determine either of the two meanings to be definitive nor can we determine the time scale of its fulfilment. As long as it is humanly possible to accommodate guests the instruction is: ‘Enlarge your house…’ (Tadhkirah, p. 380) and accommodate guests. Therefore, at least in Qadian and wherever the Jama’at can, temporary and permanent accommodation should be provided. By the grace of God in line with the revelation ‘Enlarge your house’ Qadian is being extended on a large scale. New guest houses and other places are being built and guests are provided with the utmost comfort and facilities. Of course these amenities cannot be like home and guests should be mindful of this and be grateful to God and focus on the real objective of attending Jalsa. Hazrat Musleh Maud said the Promised Messiah (on whom be peace) desired all those Ahmadis who could afford to attend Jalsa to go to it so that they could listen to discourses or give discourses about God. Hazrat Musleh Maud also mentioned that travel facilities in India were not the same as in Europe and he said that Jama’at did not have well-off people. He hoped that if well-off people were to join the Jama’at they could attend Qadian Jalsa from far off places. He also remarked that following success people tend to become lazy with a sense of ‘having arrived’ and this has a negative effect on people around them. He said men who brought their families to Jalsa have Ahmadiyyat firmly established in their families and their children develop an affinity with the Jama’at. Those who do not visit Qadian during Jalsa days not only disobey the Promised Messiah’s instructions but are also depriving their children. Hazrat Musleh Maud said that if a time were to come when our Jama’at had well-off people in USA who could afford travel, aside from going to Hajj, they should also visit Qadian once or twice during their life time. He said he was certain a time would come when people from faraway lands will travel to Qadian. The Promised Messiah (on whom be peace) had a dream that he is swimming in the air and he said that Hazrat Isa (on whom be peace) walked on water but he had swam in the air and God’s grace on him was more than on Hazrat Isa. Hazrat Musleh Maud said in light of this he believed a time would come when news during Jalsa days would relay that so many air planes with Jalsa passengers have arrived from such and such country. He said this may be something amazing in the eyes of the world but it is not amazing for God. Huzoor said we already see the fulfilment of this and it is not far-fetched that one day there would be chartered flights for Qadian Jalsa. It is God’s will to make Qadian centre of faith after Mecca and Medina. Indeed, Mecca and Medina are places associated with the person of the Holy Prophet (peace and blessings of Allah be on him). He was the founder of Islam and the master and mentor of the Promised Messiah. As such, both those places have distinction over Qadian. However, after these two places God has made Qadian the centre of guidance. Apart from being blessed places, Mecca and Medina used to be centres of tabligh which is something people living there have forgotten. Hazrat Musleh Maud said he was certain that when Ahmadiyyat will spread to Arabia, these sacred cities will return to their pristine glory. Hazrat Musleh Maud advised that everything that brings happiness also has a tinge of pain, just as flowers are accompanied with thorns, progress brings jealousy and prosperity is followed by decline. There are opposing powers in the path of attaining everything that is good. Fact is that one is not really worthy of success until one has endured pain and hardship. This is the reason that communities of Prophets of God have to endure some difficulty or the other. Some trials are so intense that those weak of faith renegade at other times people also stumble when faced with minor hardship. For example, a man visited Qadian from Peshawar during the lifetime of the Promised Messiah (on whom be peace). It was the Promised Messiah’s practice to remain in the mosque after Maghrib Prayer, and hold assembly. Indeed, a certain fervour is generated in the presence of a Prophet of God so people would rush to sit as close as possible to him. It was in such an assembly that the visitor from Peshawar started offering his Sunnah Prayers and prolonged them so much that people had to sit and wait for him to finish. But when some individuals started inching their way towards the Promised Messiah (on whom be peace) others also started joining them. In this process someone’s elbow struck the visitor. He was most annoyed at this and said what kind of a Prophet and Promised Messiah is he that people shove each other in his assemblies. And he apostatised on this trivial matter and left. Hazrat Musleh Maud (may Allah be pleased with him) said to those who visited Qadian not to stumble if they experienced any inconvenience and not to be perturbed by the multitude of people gathered for Jalsa. Hospitality is provided during Jalsa but there may be deficiencies. Attendees of Jalsa should happily put up with deficiencies and not make them a source of spiritual stumble. May the Qadian Jalsa and other Jalsas be blessed, may all Jalsa attendees be recipients of the prayers of the Promised Messiah (on whom be peace) and may they also themselves pray! Funeral Prayer in absentia was announced for Yunus Abdul Jalil Sahib of Kyrgyzstan who was martyred on 22 December. Two assailants fired at him as he stood outside his house with his neighbour.